ABOVE: During the warm months, Münchners head for outdoor restaurant tables and beer gardens. Munich has dining establishments at every price level, from gourmet institutions like Schubecks Fine Dining and Acquarello to beer halls, Döner (gyros) shops, and sausage stands. If you're like most visitors, you'll want to sample stick-to-your-ribs Bavarian specialties--and why not, unless you're morally opposed to roasted meats, sausages, dumplings, and cabbage? You'll find plenty of restaurants and beer halls and beer gardens where cholesterol is king, starting with the Ratskeller in the city hall on Marienplatz, which has been serving beer, meals, and snacks since 1874. Not far away, the city-owned Hofbräuhaus is an essential stop on most tourist itineraries, but other beer halls and gardens are just as tempting. Another classic Munich establishment, the Dallmayer coffeehouse and delicatessen, has a restaurant and a café-bistro--admittedly pricey--on the premises. Hofer - Der Stadwirt is a delightful traditional-style restaurant and Weinlokal with a courtyard beer garden in one of Munich's oldest houses. It opens at 10 a.m. for a Weisswurst breakfast and stays open for lunch, late-afternoon Kaffee und Kuchen, happy hour, and dinner. Don't underestimate the appeal of Hofbräuhaus: It offers good beer, food, and fun at reasonable prices, plus an outstanding folklore show and buffet in the Festival Hall upstairs. And no, it isn't just a tourist trap: About half the guests (up to 30,000 on a busy day) are regulars from the Munich area. Table-sharing is commonplace in beer halls and beer gardens, so if you're shy about plonking yourself down at a table with strangers, go early (before 6 p.m.) to get first dibs. For inexpensive food at any hour, visit the food courts and stands in the Hauptbahnhof, or main railroad station. The atmosphere is pleasant, the food can be excellent (the mozzarella-and-tomato sandwiches are superb), and you can watch trains come and go as you eat. Munich is loaded with bakeries, and many of them sell sandwiches along with doughnuts, coffeecake, etc. To enjoy a real treat, buy a slice of apple-walnut cake at Rischart, which has at least two branches in the pedestrian shopping zone and another in the Hauptbahnhof. 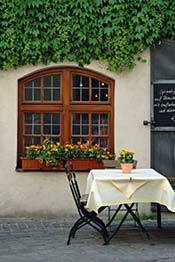 For links to restaurant reviews and guides, see our Munich Food & Drink Links page. Also see the next page in this guide--Beer in Munich--and our illustrated article on Munich's Oktoberfest. Top photo copyright © jamjoom. 1st inset photo copyright © Andreas Weber.